Not everyone has the time to manually clean their swimming pool, so many look to automatic pool cleaners to do the dirty work for them. They save lots of time and can keep your pool water clean and safe to swim in. This unit offers strong vacuuming power and is designed to scour your pool’s surface quickly and efficiently. Its two speeds are fast and really fast, and it doesn’t need any additional pumps or hoses in order to function, making it easy to use. The cleaner’s cartridge system is removable and can be cleaned by rinsing it with a hose. While the unit does a good job of cleaning, the filter seems to need cleaning a couple times a day so the suction power isn’t reduced. It also doesn’t clean corners too well and the cord is prone to tangling which can be inconvenient. Tools aren’t required to set up this cleaner and installation takes less than 10 minutes. The Navigator is equipped with programmed steering which gives it the ability to clean an average pool within three to four hours and miss less spots compared to random-style cleaners. The enhanced suction makes for more efficient and faster dirt and debris cleanup. 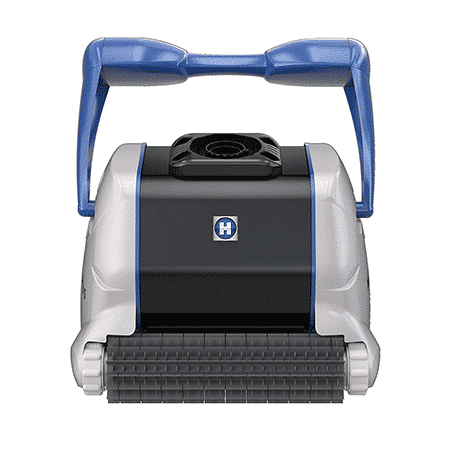 While this cleaner can pick up dirt quickly, it has less suction power compared to other newer Hayward models. It also seems to jam up from large debris such as rocks and big leaves. It can climb walls up to a foot or so, but can get stuck in the deep end of pools. With its four-wheel drive and ActivMotion Sensor technology, the Polaris cleaner is ideal for large and free form pools. Its Vortex Vacuum power allows it to pick up large debris while it keeps functioning at its maximum performance and it comes with a handy remote control and includes a seven-day programmable timer. The Polaris is quite the investment, but it’s popular for its remote control ability and cleaning power. The unit does sometimes flip over on it back, but it’s able to flip itself over again to continue cleaning. The filter is easy to remove and clean, although the cord to the unit can often get tangled up. 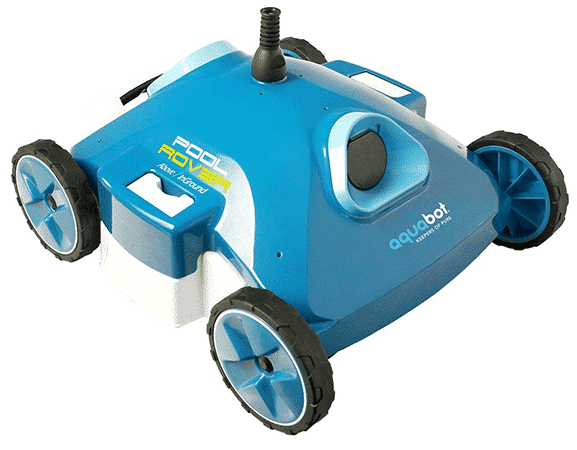 The Aquabot scrubs up dirt and debris for deeper cleaning and comes with two sets of filter bags for picking up either fine particles or large debris. It’s able to scour the pool floor, cove, and part of the walls and provides access to the filter media through the top while filtering 80-85 gallons per minute for efficient suction performance. The unit can easily get stuck at the deep end of pools and has trouble navigating its way out. It efficiently removes fine particles from the water and the filter is effortless to clean, although it tends to skip corners and stays in certain areas of the pool for long periods of time. 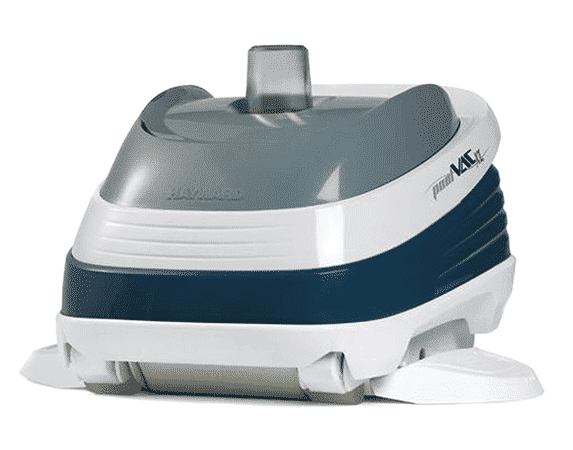 The Hayward 2025ADV operates silently and can easily connect to a skimmer or suction port in less than 10 minutes. You don’t need any additional equipment because it’s powered straight from your pool’s filtration system, and the pre-programmed steering pattern guides the hose as it navigates the unit around the pool floor and eliminates the hose from tangling. The unit only has a radius of seven inches when it comes to climbing walls, and it tends to get stuck in certain areas of the pool. On the other hand, it works quietly and picks up small particles with little to no problem, but you need to purchase a separate leaf canister for larger debris. 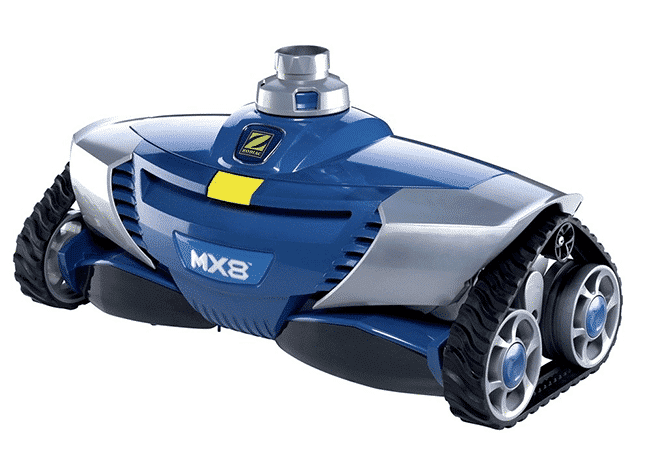 The Zodiac MX8 offers advanced dual navigation for thorough pool coverage and its X-Trax tires give it the ability to climb vertical walls and get into tight corners. Your pool system won’t be under too much pressure since the Zodiac’s ultra-efficient power source performs at its best at low flow. It’s ideal for in-ground pools and is compatible with variable speed pumps. The unit’s suction power can pick up small debris and leaves, but if anything gets caught, it will stop operation until the obstruction is cleared manually. It’s not too good at picking up broken sticks and bark and needs a bit of a push to go up walls, but overall the Zodiac is a decent cleaner for pools with flat levels. 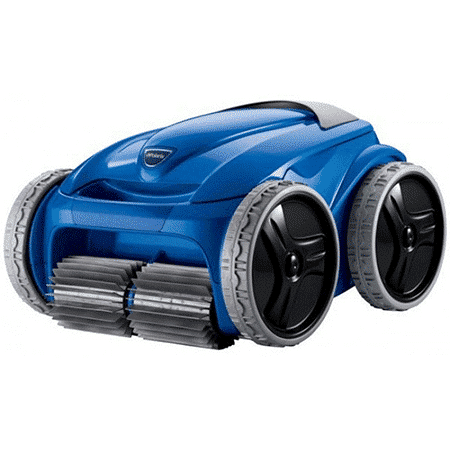 This four-wheeled cleaner effectively cleans both above-ground and in-ground pools and it’s able to vacuum up dirt particles, debris, and other contaminants from pool floors and coves. The filter bag can be accessed through the top of the unit and can filter over 80 gallons a minute. It’s also an optimal cleaner for those that want to save water and energy. Aside from its powerful suction technology, the unit does need a bit of moving around since the wheels are a bit tricky to adjust. The filter bags are easy to clean and can even pick up debris without getting jammed. It also seems that the cord doesn’t tangle much, but the cleaner can get stick in certain areas of the pool. 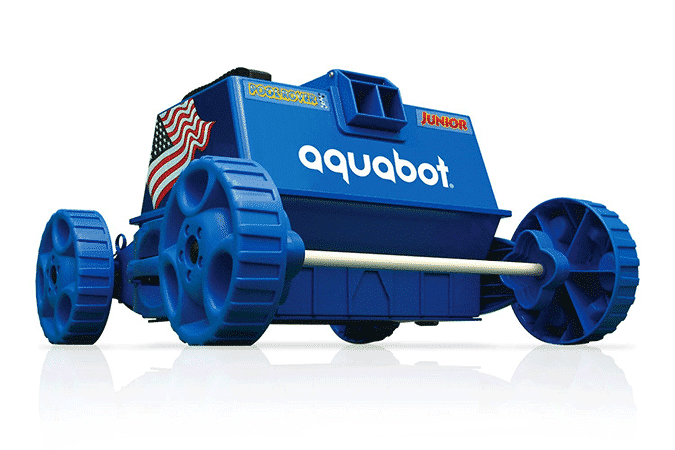 Able to vacuum and micro-filter unattractive dirt and debris from your pool, the Pool Rover Junior can filter over 70 gallons of water per minute. The filter bag is easily accessible through the bottom of the unit and can pick up dirt as small as two microns. It’s mostly ideal for flat-bottom above-ground pools and is easy to set up for all you have to do is plug and play. 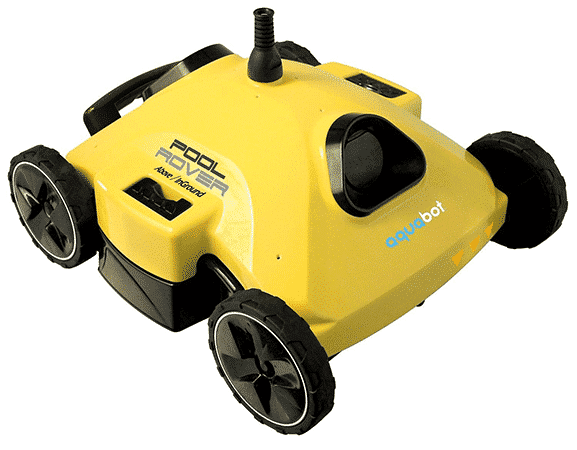 The Pool Rover Junior does an efficient job of scouring pool floors and picking up debris, but it won’t climb up walls without flipping over. The cord can twist up as well which will require you to check on the unit every now and then to make sure it doesn’t stop operating. Lightweight and user-friendly, the Dolphin Nautilus scrubs, vacuums, and filters out dirt from your pool’s surface in under three hours. The cartridge filter is easy to remove and the swivel cable prevents any twisting or tangling. The cleaner is ready to use after simply plugging it in, and there’s no additional connections needed. It’s mostly ideal for in-ground residential pools up to 50-feet in length. The unit is a bit on the heavy side, so a caddy might make it easier to haul it around. The filters do need cleaning very often, although they pick up quite a bit. It can also climb walls, but the scrubbers aren’t very effective in certain areas of the pool. Filter can pick up sticks, leaves, dirt, etc. 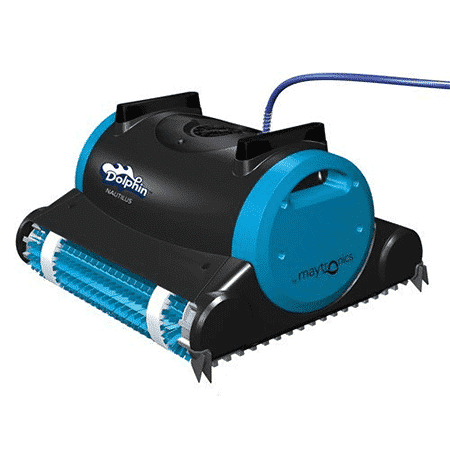 The Dolphin Nautilus Plus’s CleverClean technology lets the unit clean the pool floor, walls, and waterline, and to keep operation consistent, the Maytronics patented swivel cable makes sure the cord doesn’t tangle or twist. Additionally, the Nautilus Plus doesn’t need your pool’s pump and filter to perform, saving you energy. With its 360° suction, the unit filters and collects debris in its self-contained filter so you save water. 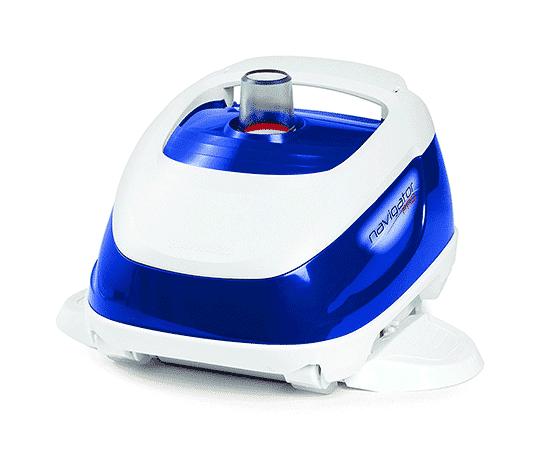 This is a fairly popular unit for it’s lightweight, powerful, and easy to clean. Although, the cord may be a bit short for some users with larger pools. It also won’t climb stairs and walls all the way, along with being a bit heavy as you pull it from the water.